RouteMIDI, in conjunction with a DAW such as Garageband, will allow you to create tracks that will use any of your external MIDI synthesizers for that track, as alternate to instruments etc. built into the DAW. 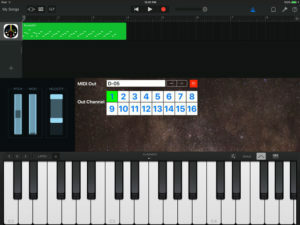 Use external MIDI gear with Garageband and this app! For each track that you select RouteMIDI as it’s Audio Unit, you will be able to browse through whatever external devices are connected. Then, you may optionally direct the MIDI to any of the standard 16 Channels so that Multi-Timbral units are supported.